Case Description: In preoperative preparation for cardiopulmonary bypass surgery for revascularization a 74 year old female with past medical history of hypertension, CKD Stage II, and new onset NSTEMI underwent central venous catheter placement under ultrasound without any complications. Central line confirmation was confirmed in the venous system by placement of ultrasound to confirm wire in the Right Internal Jugular, prior to placement of line. Subsequently, a pulmonary artery catheter was introduced while watching the pressure waveform on the monitor to confirm placement as the catheter was advanced to 60cm. The waveform was inconclusive to determine correct location of pulmonary artery catheter. The balloon was deflated and the pulmonary artery catheter slowly pulled back. At approximately 35cm, resistance was felt and the catheter was unable to be pulled back. 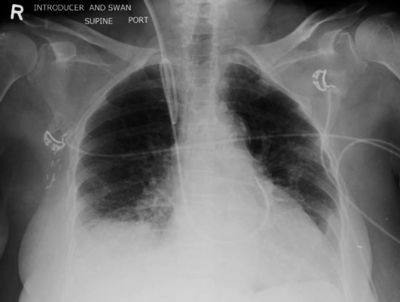 A chest X-Ray was performed to determine location and orientation of the pulmonary artery catheter. Chest X-Ray showed kinking, however not knotted, in approximately the region of the Superior vena cava. To prevent possible shearing of the Right Internal Jugular vein with forcible removal of the PA catheter, discussion with the surgeon determined the best course of action to be, during cannulation of the Right atrial appendage prior to initiating cardiopulmonary bypass, the surgeon would attempt to provide counter traction, distally, while pulling back on the catheter proximally, ultimately correcting the kinking and allowing free removal of the pulmonary artery catheter. During cannulation of the RA, the surgeon was able to grab the PA catheter using forceps and provide the necessary counter traction to right the kink and allow removal of the PA catheter. A new PA catheter was placed without issue, and confirmed placement via chest x-ray. The surgery proceeded without issue and the surgery was uneventful. Discussion: Multiple options exist to correct a kinked or even knotted pulmonary artery catheter, some more invasive than others. The method described here, being one of the most invasive, is suitable as an alternative to non-invasive options when cannulation of the Right Atrium were to occur for initiation of cardiopulmonary bypass. Other non-invasive options that could have been implemented were placing a wire in Interventional radiology to unkink the catheter. A wire could also be used to pull the catheter over as a rigid conduit for removal. Other methods have been discussed in the literature such as using interventional radiology or vascular surgery to cannulate the right femoral vein and cutting proximal to the knot or kink and removing the distal portion of the now cut catheter via the femoral vein, while removing the proximal portion of the remaining catheter out via the internal jugular vein. If these methods were to fail, open invasive removal via sternotomy may be indicated.